Great news for women who are experiencing female hair loss: There is a new hair growth laser therapy system named the Theradome laser helmet that just came out and it is the first FDA-cleared home-use device. There was a similar hair loss treatment product called iGrow, but it was only recommended for men. ALL clinical trial participants who used the Theradome therapy helmet found one or more of the following results: thicker and fuller hair, a decrease in hair loss, and new hair growth after using the product for 3 – 4 months. The laser Theradome helmet has more diodes (where the laser lights come out) than laser comb (ex: hairmax). 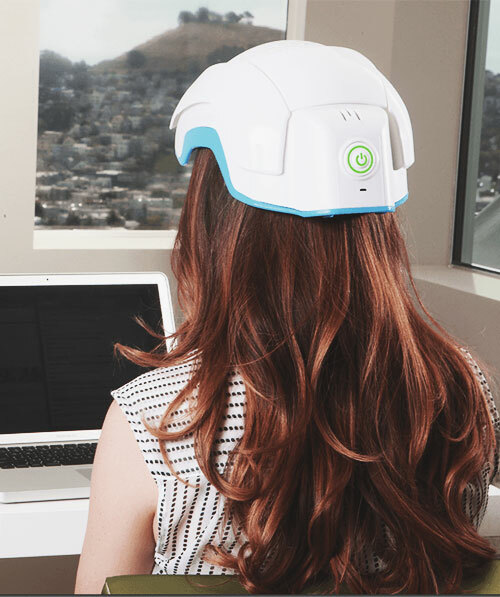 Also, it can be more convenient to use since you don’t have to keep moving the device around to cover the entire scalp. The product is currently FDA cleared for women and we believe this can be a great option for women with hair thinning or balding issues. 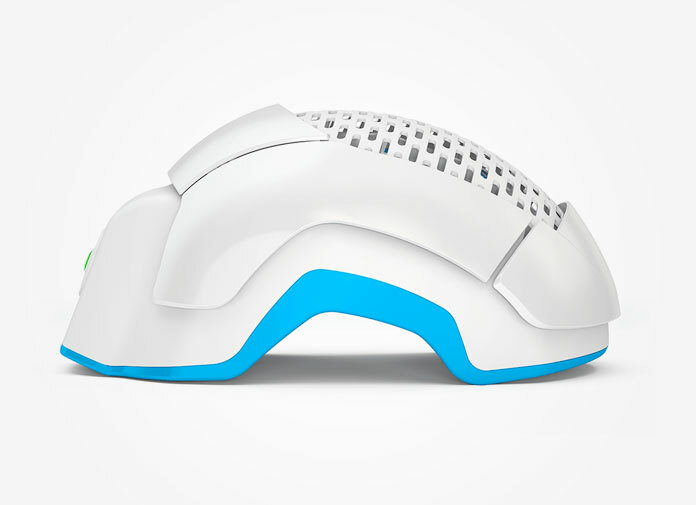 The Theradome hair growth helmet is currently priced at $895. Compared to the in-office hair loss laser treatment, which usually costs about $4000 or up, the device appears to be more reasonably priced (even though it’s still on the expensive side). Read our detailed Theradome review. I am currently on week 6 with the Theradome. My blog showing weekly progress photos is theradome.weebly.com . Hi, Thank you so much for posting your before and after progress on your site. Please keep us posted! I’m suspicious when the person with the blog goes around posting his link everywhere. Especially here in a woman’s hair loss site. So I tried the Theradome product for almost 3 months now and I saw no results. I called up their service line for a refund and was quckly denied because I didn’t register the helmet the day I received it. I asked what the difference was whether I registered the day I got it or later was and the customer service rep could not produce a response other than “it’s policy”. I asked to speak to a manager or something who could speak on behalf of this policy and she said there was no one available. A day or two later I get called back by someone else representing Thereadome saying they would like to give me that refund I asked for, and to just call them back. I call them back and get asked again if I registered on the day I received my product. Again, I told them no, but was told I could get a refund. Again, I was denied. Not only do I feel extremely frustrated with Theradome, but I also feel cheated and lied to. I know the product may work for some people, but it didn’t work for me; part of the reason I wanted to try the product was because of their 120-day refund “guarantee” that they advertised the product with. That’s really frustrating. Especially when it’s fairly a new and expensive product, we expect the business to have great customer service. I am pretty sure many other people who purchased Theradome made the decision because of their 120 day refund guarantee. I will email all Ms. Full Hair readers about this. Please let me know if you hear anything back from them again. So, I’ve been using the Theradome now for right at 6 months and couldn’t be happier. If you’ve ever used LLLT before, you know that it takes time. If you expect results other than a better feeling scalp and healthier feeling hair, you’re going to be disappointed with any LLLT device including the KING, the MEP-90. If you’re patient and take start, during and after pictures, in 6 months or so, you will begin to see the changes- IF you’re suffering from AGA, or your loss is from stress, hormones, etc. in time you, like many others, will begin to see new vellus hairs in thinning areas and you will see greater coverage from your existing hair as it begins to loosen the grip that DHT has on the follicles and hair. I’ve used the MEP-90, the HairMax, the iGrow, and now the Theradome. Results from the Theradome have been as good, or better than the MEP-90. The iGrow actually didn’t even keep what I’d gained from the MEP-90. After looking into it further the iGrow contains 21 lasers and like 40 LED’s ( LED’s have never been shown to do anything for hair), and the HairMax with it’s 9 or 12 lasers is not only weak, but nearly impossible to be compliant with.